I just finished this small purse today, completing the purple fluffy edge. I had made this to give to a friend as a gift, but I’ve decided to make her something else instead! I don’t know who I’ll give this one to. The other week while on youtube, I stumbled upon some videos of a stitch I didn’t know. 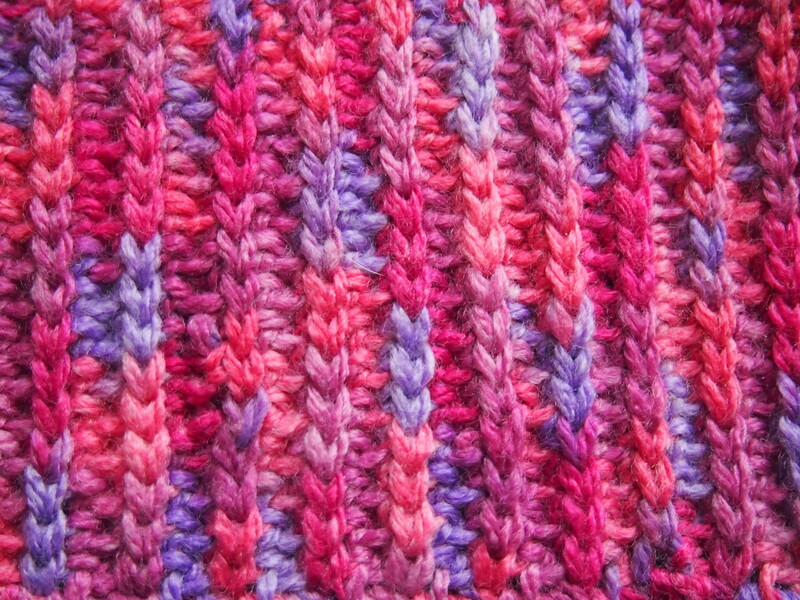 It was called the ‘camel stitch‘. It was interesting because it’s supposed to resemble knitting, so I decided to give it a try. I made a rectangle that measures 18cm x 8cm of the camel stitch. Then I went around it with a border of 2 rounds of sc. I used the last of my berry pink yarn from Lincraft, and a 4mm hook. 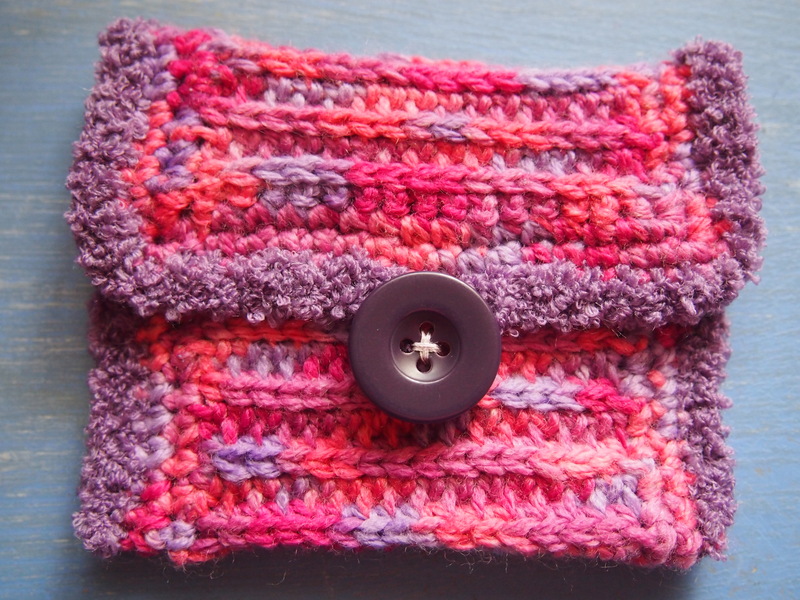 Then I folded it to make the purse and stitched the sides and the lip in sc, leaving a 5 ch loop for the button, using the fluffy purple yarn. I ended by stitching a large purple button on the front. Hey presto! A small purse! I made this little bag today (last Saturday), I’m thinking this might be a gift for a one year old girl and inside I will hide a small toy or book! Like almost all of my little bags, I started this one with a row of dc, then 2 extra dc in the end then continue around the other side of the ch dc in the bottom of ea dc, then 2 more dc in the other end, sl st to make a round. The second row is another round of dc. 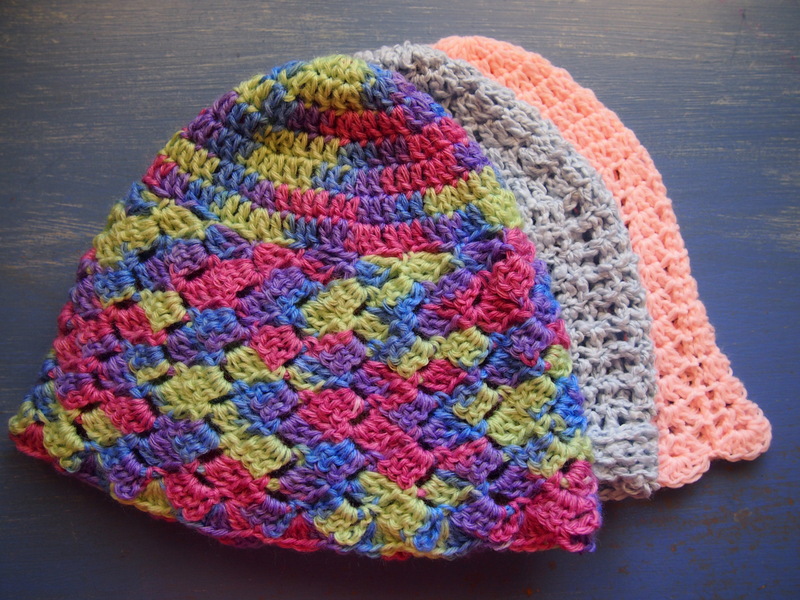 Then I put a part section of the same shell stitch as in the caps I made in this same soft silky acrylic yarn. I did that for 10 rounds, then 2 more rounds of just dc. I then do a round of 2 ch, (sk 1, sc, 1 ch) repeated to end, sl st in 2nd ch. Then the lip is finished with 2 rounds of dc. I then made a long ch to form the drawstring, which is threaded through the 1 ch, 1 sc round. Lastly I added a ch handle, then a second row of dc into that handle. I embellished with some fun fluffy yarn at the lip to add some extra colour and texture. 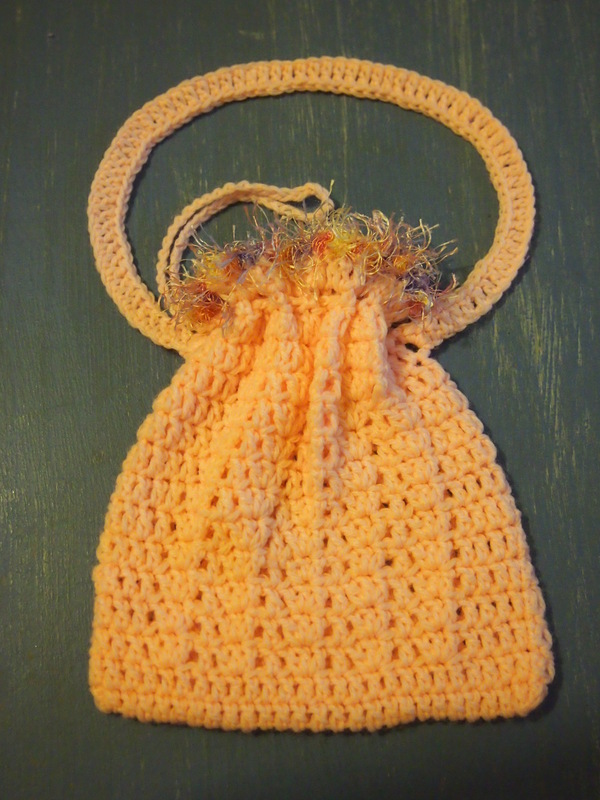 For this bag I used a 3mm hook to make it more firmer than the hats, when I used a 4mm hook so they come out light and airy. I hope this will make a nice little gift! I’m really pleased how this cap turned out, I hope it fits the intended recipient and that she likes it enough to wear it! 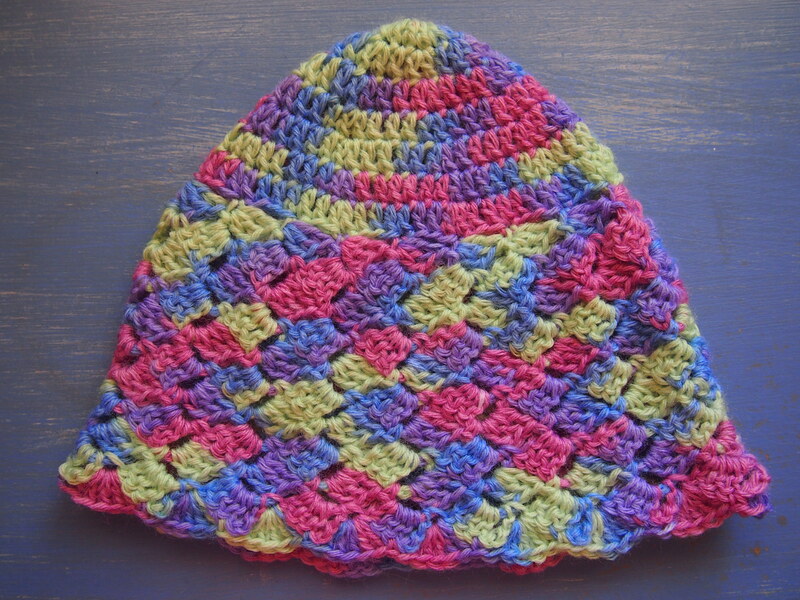 For this cap, I used a beautiful variegated yarn from the Wangaratta Mill, which is in Australia. If I had a choice, I would only use locally produced yarn, but of course its amongst the most expensive. Luckily I found this yarn on special! It has flecks of green, purple, pink and blue in it, which is very nice! My guess is this is acrylic, not wool due to the price I got it at, but I might be mistaken as the label did not say. For this cap I used the 4mm hook and started with 7 rounds of increasing dc. I then tried a new stitch I saw for the first time the other day on youtube called a slanted shell stitch. I had to have a think about how I would do it in a round though. I turned the cap around and went back the other way, starting with 3 sl st before starting the slanted shell pattern. There are 10 rounds of slanted shell in this cap. Finally, I edged it with 5 dc scallops, with a sc in the 3rd dc. This is 24cm along the rim (so 48cm circumference), and its 19cm high. This cap might be too warm to wear on a hot summer’s day, but hopefully it will make a very pretty autumn cap. I finished the medium size pink cap on Thursday, after finally working out a size that might fit a 9 year old. I made a small size, and then an adult size, before doing that though! These caps are intended for a 9 year old girl who has started chemotherapy. How awful for her, I hope she likes at least one of my caps enough to wear and help her through this time (as little comfort as that may well be). 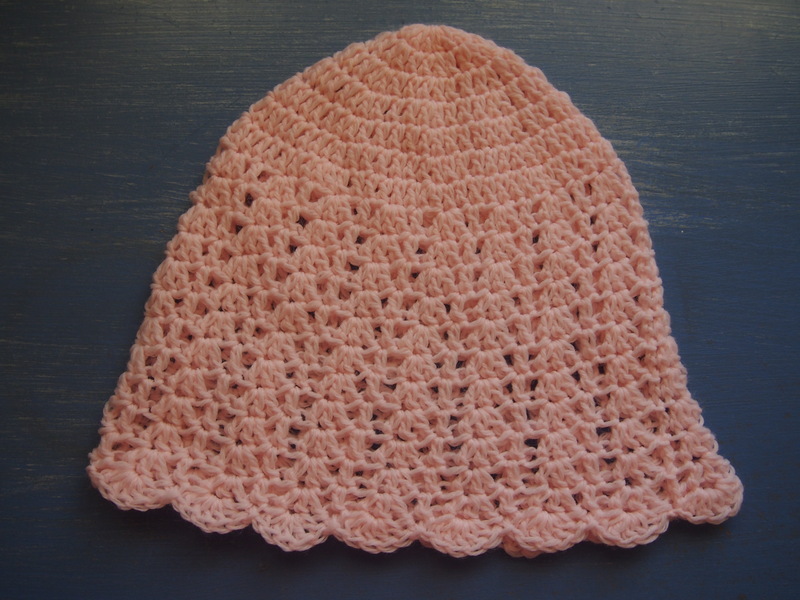 The light and airy, pretty pink cap has 7 increasing rows. Then there is the shell pattern to the end, finished off with a scallop edge. The pattern is 2 ch sk 1, 3 dc, sk 1 (1 dc, sk 1, 3 dc, sk 1) repeated to end, sl st. The scallop edge is 5 dc into every middle of 3 dc, with a sl st into the single dc. I used a 4mm hook for this one, just like the other two pink caps I made. Without stretching it, the cap measures 23.5cm across the base (so 47cm circumference), the height is 19cm. There are 7 increasing rows, then 11 rows of shell pattern, then one round of scallops. I hope I get to find out if any of these fit! 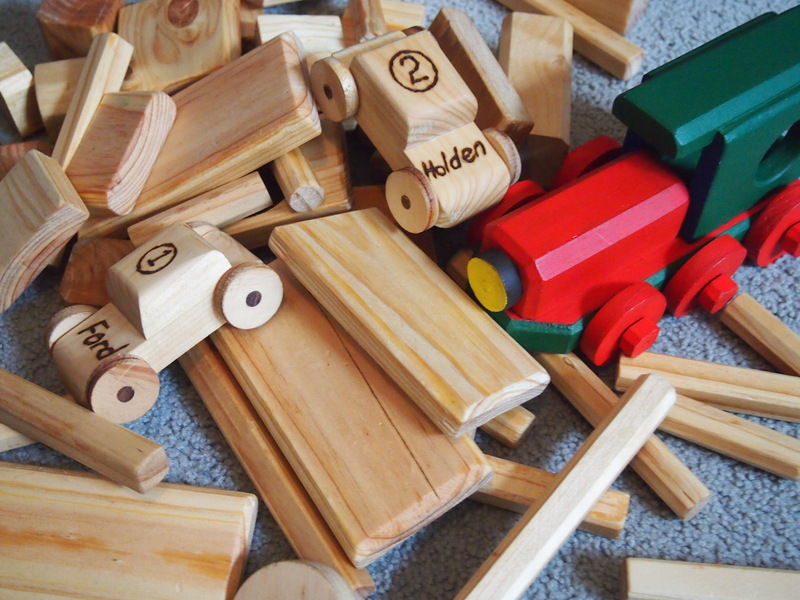 Isn’t this collection of wooden toys just lovely? Its so much nicer than the mass produced blocks you buy from the store. All the more special are these toys because they were made for Thomas by his grandfather. 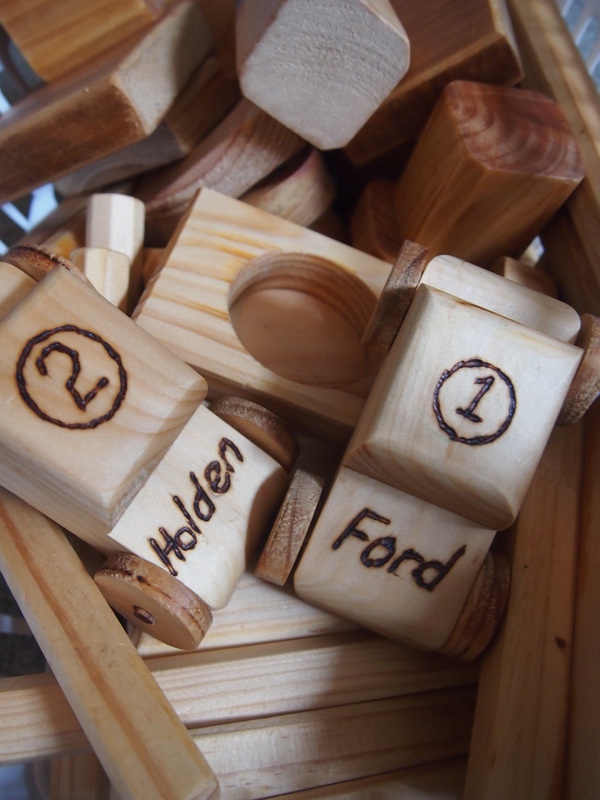 These are something you would want to keep and treasure, and hopefully pass on one day, because no one has anything quite the same as these wooden toys. I’m not sure where the wood came from originally, but I think these are at least some what environmentally friendly because they were made from scraps of wood from Pa Murphy’s workshop. For something like this you really shouldn’t buy any wood especially, as any tiny bits of left over scrap wood of any shape will do. These were lightly coated with vegetable oil so a very nice, environmentally friendly toy for Thomas! Another reason why I like these toys is because they are a classic and timeless toy that doesn’t have the branding you see everywhere nowadays. As much as possible, I’d like to help Thomas learn the true value of things, and not according to if they have some recognisable logo or image on them, as hard as I know that is going to be! 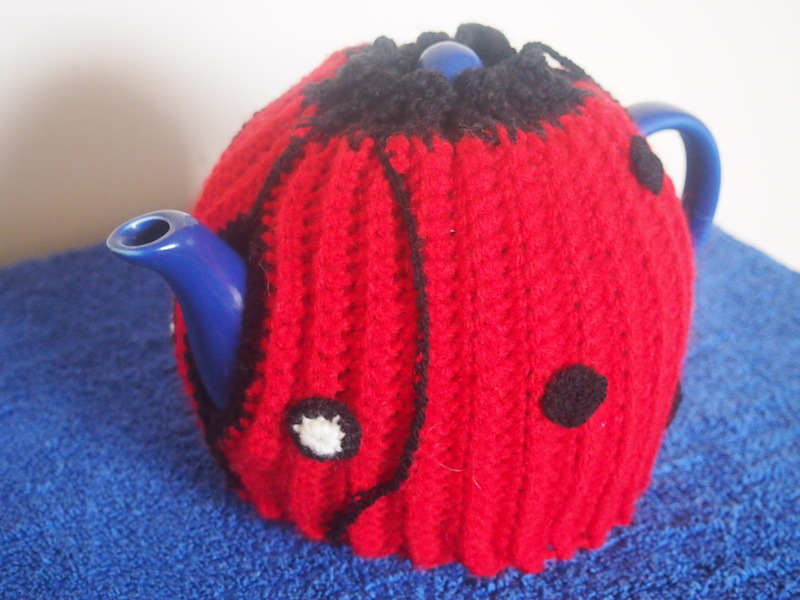 You’d think that deciding to decorate a red tea cosy to make it look like a ladybird wouldn’t be too hard, right? Well, it turned out to be a lot more difficult than making this reversible tea cosy in the first place! 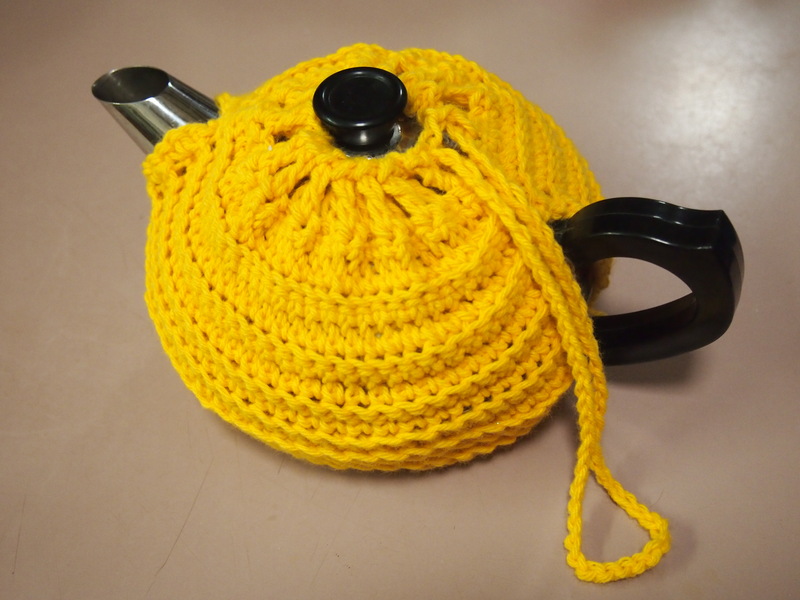 The idea for this tea cosy is based on the first one I did in a sunshiney yellow. But that was only one layer, this one has two layers for added warmth. Because it has two layers, why not make it reversible, right? I wasn’t sure I would be able to do it, but it turned out to be fairly straight forward. I know the recipient requested neutral tones, which is why the first layer is a tasteful grey, but it’s for a red tea pot, so I couldn’t resist some fun! And I had a good roll of nice red yarn to do it with. I started off with 4 squares, 2 in grey and 2 in red. This time the ridges are vertical, not horizontal like in my yellow tea cosy, so there is more stretch. I don’t have the intended tea pot here to test the size, so hopefully it will fit with the extra stretch. For the body I used a 4mm hook, and medium weight yarn. 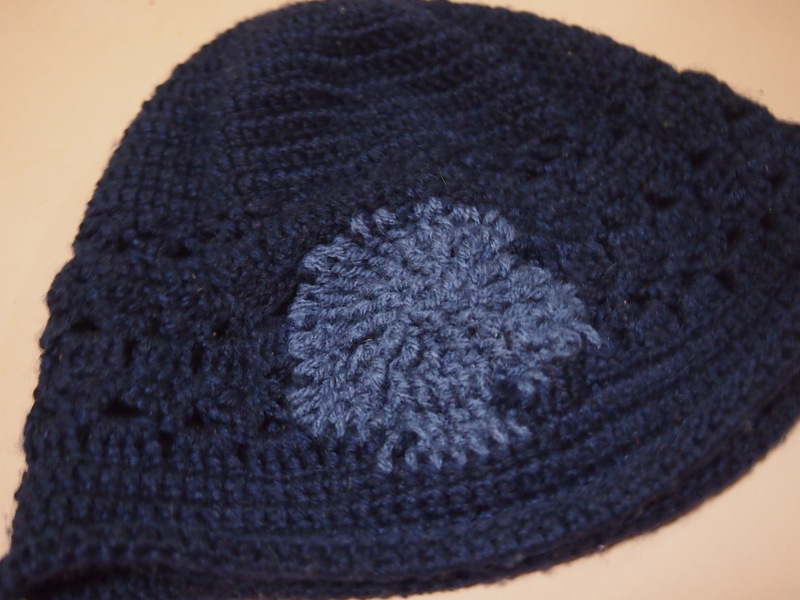 I ran out of the thick black, so had to start using a finer black wool for the edging, as that was all I had. Because at least some of the black is pure wool, as well as the grey which looks like it might be a sock wool, this tea cosy will need to be washed as if it was wool, just in case there is some shrinkage. Another idea I have for a tea cosy, is making one side green and decorating it like a garden with butterflies and flowers. Joining up the squares and neatening off the edges proved to be fairly straight forward. Making the final decision on how to make the red side resemble a ladybird was trickier. Do you think it looks like a ladybird? I hope the recipient does, and gets a nice surprise when she turns the grey tea cosy inside out! This is my first attempt at a tea cosy, and considering I didn’t have the tea pot with me at the time to fit to measure as I went, it turned out damned well! It was pretty damn lucky this thing fit, but I did use a stitch that has a lot of stretch in it so it had a chance. I chose some nice soft acrylic my mum had spare and started with two rectangles of alternating rows of ridges. In hind sight, the ridges should have gone vertically instead of horizontally for even more stretch. This would increase the chance of the cosy being used for different tea pots. I chose the cheery and bright yellow colour, not only because it felt soft and would be nice to work with, but because it is a sunshiney happy colour for good luck, perfect for a family kitchen. I was staring at the two rectangles wondering how to fix it all up as there were several options. In the end I opted to do a quick job with minimal fuss, with 1 dc 1 ch along the top for the ch pull handle. Next time this should only be 1 sc 1 ch to reduce heat loss. If I wanted to do a really good job, I could do two layers and sew them together with a 1 sc 1 dc lip, or maybe that would need the 1 dc 1ch lip, because it will be that much thicker. Also, there should be another row of dc above the lip, to further reduce heat loss. All good to note for the future, in case any one else wants me to make them a tea cosy. I whipped up this tea cosy on Christmas Eve while everyone else slept and I couldn’t. It took me just under two hours, and I used either my 3.5mm or 4mm hook. On Christmas day I did a free form patch on my brother’s damaged beanie, I just used some blue that was on hand, it doesn’t match very well but I’m sure it doesn’t matter as this beanie is bound to end up in the bin. It was very tricky, especially as I’ve never done it before, but because I am so clever I did an absolutely awesome job!! 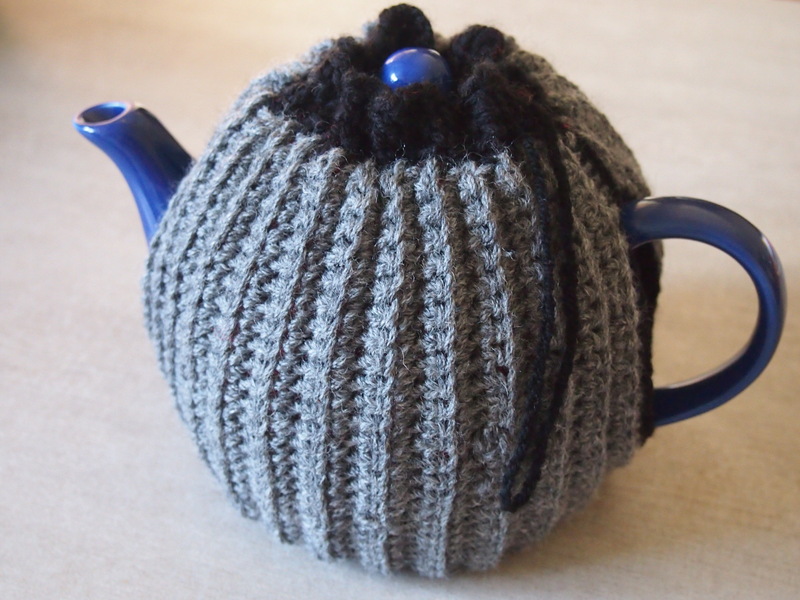 I can not for the life of me imagine why anyone would think it was ok to take to an especially made custom crochet beanie with a pair of scissors to rig up a tea cosy, but truth is stranger than fiction it seems. Thanks for taking some time to read my blog.